When I first read the original Runaways by Brian K. Vaughan and Adrian Alphona I said, “Geared towards teens, this graphic novel perfectly captures children’s angst towards their parents and their thoughts of how they will be better than them and their wicked ways.” I thought the premise of the story was fun and fresh and would really appeal to the younger reader. While I didn’t read further than the first volume, I know who of the original six was the mole, and what happened to the parents of these youth. This book reunites the group in dramatic fashion as Chase brings a dying Gert from the past into the future for Nico to heal with her magic powers. 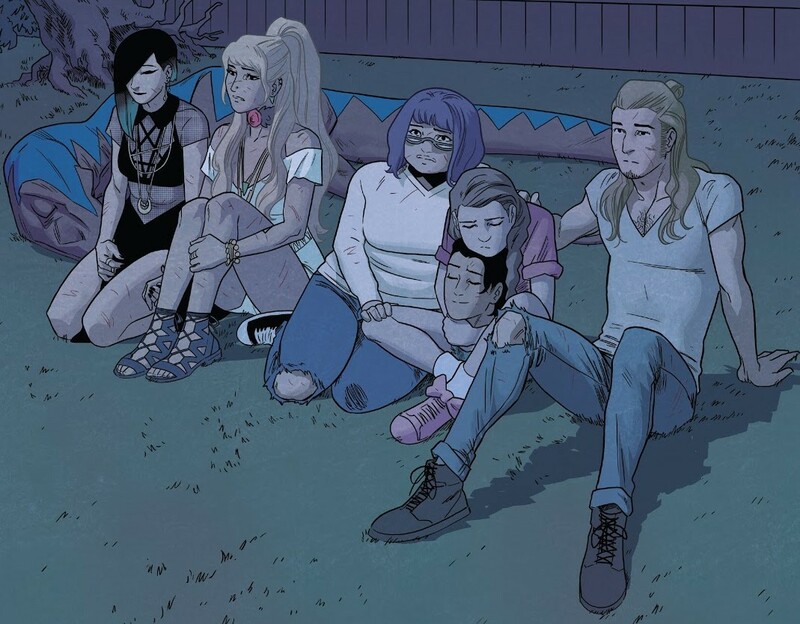 Suddenly Gert is thrust back in present day, while the rest of the Runaways have aged two years, leaving her significantly younger than Chase who had been her boyfriend at the time of her death. These three seek to reunite the group, as they had gone their own ways after Gert’s death. They first meet up with alien Karolina who is happy in college and in a relationship, and doesn’t feel the need to rejoin. Then they head to find Molly, who has been living with her Grandma, as she is only in middle school. Molly’s scientist Grandmother is (of course) not what she seems, and the five remaining Runaways must band together again. This story had a lot of plot threads from the past to pull together into a cohesive new narrative, and sometimes I struggled with keeping up. I appreciated the clues given in character’s thoughts or dialogue and even a few author asides to catch the reader up to what happened in the past. There was a mention and a picture of Nico when she belonged to the A-Force during her time away from the Runaways and another mention to Victor’s fate (who was a member of the team in later volumes). So although I had read the first book of the series, plus other books that had these characters in it, I still felt muddled at times. A new reader to this series is going to have to play a lot of catch up to understand what is going on. Rowell’s dialogue is spot on, as I knew it would be. I am a huge fan of her novels (especially Eleanor & Park) so I have to commend her for adapting well to the comics format. But she might want to tone down the quips a bit as snarky conversation can get old, for I was frustrated with Gert throughout the entire story. I don’t see her appeal, much less as a genuine love interest to Chase. The art by Kris Anka was a great match to the story. I liked how he incorporated Old Lace and the cats into the panels, with little jokes going on in the background. At times some of the art was anime-inspired and he drew great crowd scenes. I enjoyed that some of the chapter breaks included variant art, a few from original artist Alphona. This is a series that I will definitely keep on purchasing for the teens at my library. I feel that the series will continue strongly under Rowell and Anka’s direction, as they dropped enough clues in this first volume to promise great adventures in the future. Rowell, Rainbow & Kris Anka. Runaways: Find Your Way Home. 2018. I appreciate your comment about “struggl[ing] with keeping up.” The Runaways are one of those teams/comics that happened while I was away from active comic reading. I’ve heard about them. I know how important/critically acclaimed they became. And I know how excited everyone was for this comic to return. But I haven’t brought myself to jump in just yet… Now I feel, if/when I go forward to check it out, I’ll be sure to start at the beginning. Thanks for watering the seeds of my intrigue with this title again while also giving me a realistic sense of when/how I should approach it. All in all, you’ve kind of done a lot of work for me here and it’s appreciated :). The Runaways will be most enjoyed by younger readers. Some YA books and/or graphic novels appeal to all ages, but I felt I wasn’t connecting that deeply. While I plan on buying future volumes for my library’s collection, and will skim them, I don’t truly plan on keeping up with the series myself. Also good to know! To be honest, the title wasn’t a huge draw to me – even though I knew it was one of the ones “everyone” was talking about from my hiatus in comic reading. However, I’ve been surprised at how many adults I hear talking about it, some even going to our local comic shop JUST for this series, being okay with reading everything else later and in trades from the library. I wasn’t sure what I was missing. So, maybe, I wasn’t missing too much. It’s probably a person-by-person thing. However, given my “read whatever Nancy suggests” philosophy, I’ll know not to rush this :). What a thoughtful and interesting review! Thanks for sharing!